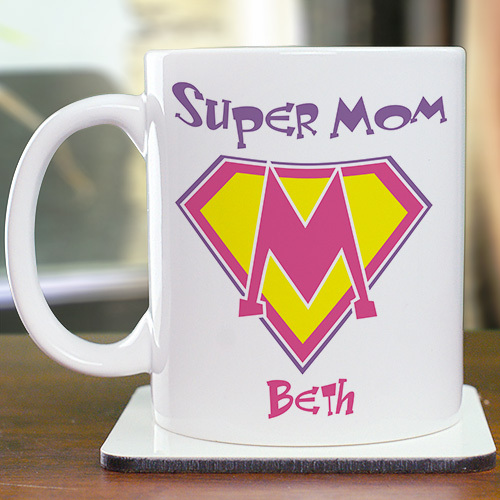 Let your Mom know how much you appreciate her with our Personalized "Super Mom" Gift Coffee Mug. A fun way to celebrate Mother's Day while revealing her secret identity. Your Custom Printed Super Mom Ceramic Coffee Mug is Dishwasher safe and holds 11 oz. Includes FREE Personalization! Personalize your Super Mom Coffee Mug with any name. Additional Details Mother's Day is the perfect time of the year to celebrate and acknowledge all the things your Mom does each and every day. Honor her with a Personalized Mother's Day Gift from GiftsForYouNow.com. We have the finest gifts for Mom, Grandma, Nana or Granny.